By presenting evolutionary biology as a dynamic, ongoing research effort and organizing discussions around questions, this best-selling text helps you think like a scientist as you learn about evolution. The authors convey the excitement and logic of evolutionary science by introducing principles through recent and classical studies, and by emphasizing real-world applications. Jon Herron (University of Washington) is a dedicated teacher, author, and software developer. He is committed to improving how evolution is taught to today’s students, and he enjoys staying on top of the rapidly-changing field of evolution. Almost as fast as overpaying at the on-campus book-store. 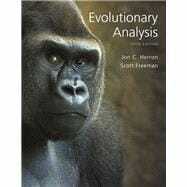 Evolutionary Analysis: 3 out of 5 stars based on 1 user reviews.